Sterling silver ring inlaid with Australian opal and sugilite. 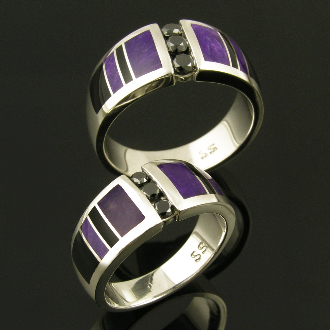 Unique his and hers sterling silver black diamond wedding band set inlaid with sugilite and black onyx. Matching handmade ring bands feature 3 channel set round black diamonds flanked by alternating black onyx and purple sugilite inlay. His wedding ring has 3 black diamonds totaling .24 carats. The ring is 9.5mm wide and is shown in a size 10 1/2. This band is available in other sizes and color combinations by special order in 3 to 5 weeks. It is hand signed "MMH" by Mark McBride Hileman on the inside of the ring. Her wedding band also has 3 channel set black diamonds and they total .18 carats. Her ring measures 8.5mm wide and is shown in a size 6 1/2. It is also available in other sizes and color combinations. Learn about sugilite on our Stone Information page. Price shown is for the his and her ring set. Upgrade to Continuum sterling silver for added durability and tarnish resistance. Learn more! *All of our wedding sets are available in his/hers, hers/hers and his/his matching ring set combinations. Price for his/his combination will be slightly higher and hers/hers will be slightly lower.